We often think of solar-powered devices as pretty new. 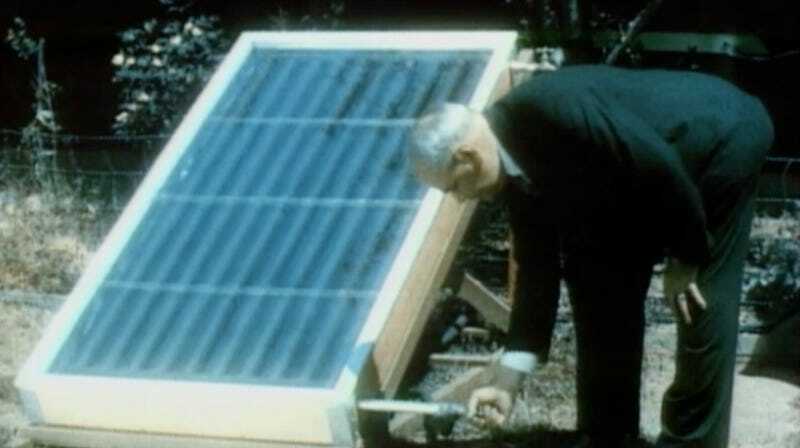 But we’ve been harnessing the sun since long before the first practical solar cell was introduced back in 1954. For instance, in these solar-powered contraptions from a 1937 Popular Science film — including the amazing fridge that turned sunbeams into ice cubes in just two hours! From the 1930s until the 1950s Popular Science had an exclusive deal with Paramount movie theaters to show their short films. This particular short film originally appeared in theaters in July of 1937 and gave movie-goers a peek at the wonderful solar-powered future that was to come. I’ve transcribed the video below for those who can’t be bothered to watch this amazing retro-futuristic artifact in action. Everything that moves upon the earth is actuated by the sun. On this scientific fact, Otto H. Mohr of Concord, California has based innumerable inventions that have revolutionized nearly every form of modern utility. Among the achievements of this man of action is this economical storage-type water heater. Cold water entering at the bottom of a series of copper tubes is heated by the sun’s rays. Drawn off to a faucet at the top, the water has a temperature as high as 180 degrees fahrenheit. Even on cloudy days the violet rays of the sun maintain the process. By a method of heat absorption the sun also operates this futuristic innovation in drinking water coolers. The device irradiates, purifies and refrigerates. Thus, Mr. Mohr has harnessed the heat of the sun to produce ideal drinking water the year ‘round. This scientific magician attracts and holds the sun’s rays by use of a crystal ball mounted in a box he calls a solar generator tank. Once again, heat is made to produce its opposite by the development of the most economical refrigerator yet devised. Ice cubes from sunbeams in two hours. In still another type of generator, water is heated by solar rays. An unique method of vaporization, condensation and absorption results in the remarkably inexpensively production of hydrogen gas of unestimable value for cooking, heating and power, made from ordinary water. Otto H. Mohr and other men of thoughtful purpose will some day free the world of needless toil. Their appreciative understanding and control of nature’s forces will have earned for themselves and all mankind a better place in the sun. Correction: This post originally misspelled Otto H. Mohr’s last name. Paleofuture.biz regrets the error.